I need help again! Several of you sent suggestions for our basement last month. They were all great ideas but we decided to put off the basement right now...half of it is extra space that we have no clue what to do which makes it hard to decide how to decorate it since we don't yet know it's purpose. Instead, we're working on the upstairs which should be relatively easy but for some reason we can't decide on a color scheme! We already have the furniture we need, just not what colors to add. 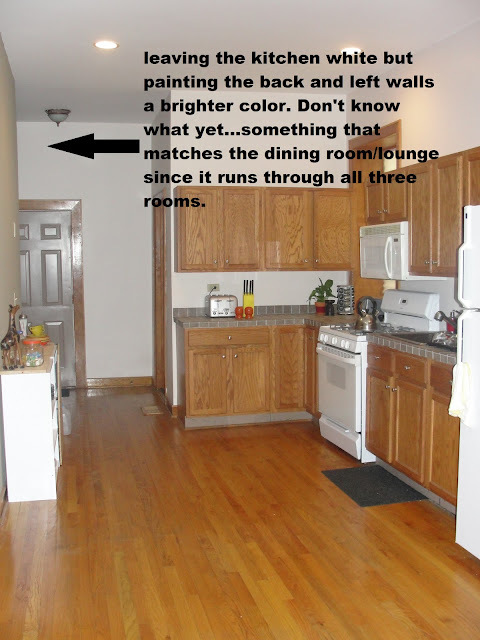 So far, I think the only thing we're sure about is that we want to put up two walls to divide the dining room and break up the space. They won't be anything fancy...just a basic 2x4 and plywood solution that won't break the bank. Our ceilings are super tall but the walls will only be 8' tall so the room is still open and airy. Let me know what you think...I've been looking at this so long I can't think anymore!! View looking from back door out to apartment. Don't like the open, cluttered look. 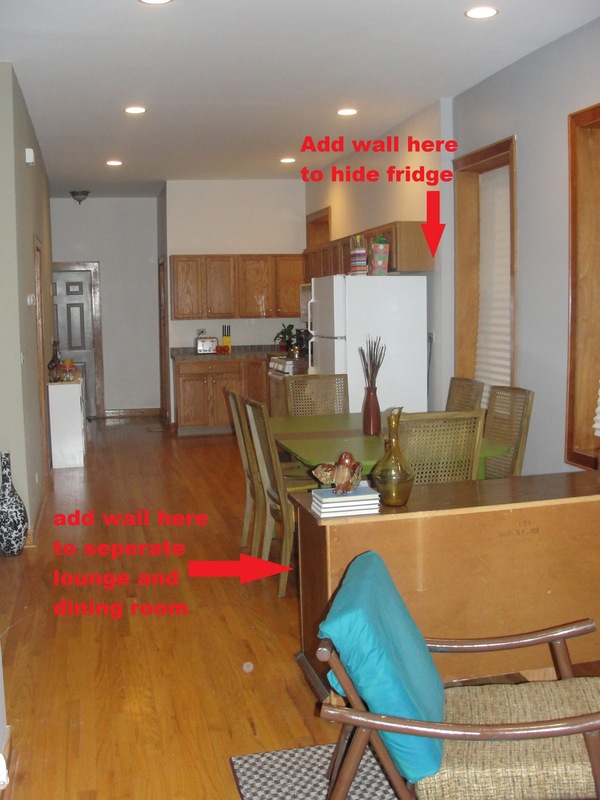 Adding a wall next to the fridge (left side of pic) so it's not so close to dining room. I have a few fabrics picked out for chair seats. My favorite is orange and white and would look cute with the chairs painted black. I don't know what color the table should be. Also need to pick a color for the sideboard (used to be a dresser). What colors do you think would work? Too much going on when you look from dining room to lounge. Want to add a wall to separate the space. Also fixes my color problems...without the wall, I feel like I should leave the dining chairs brown to tie in the two rooms (brown chairs in dining room, brown bookcase in lounge). 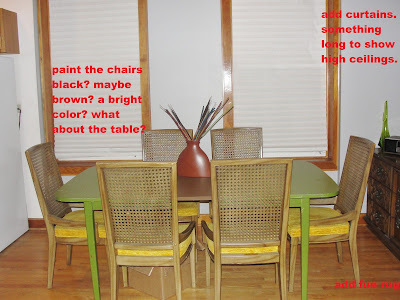 With the wall dividing the rooms, I can paint the chairs whatever color I want! Should it be a half wall (coming up just a foot above the sideboard) or a taller wall (8') so the rooms are more divided? Thoughts? Looking into lounge. 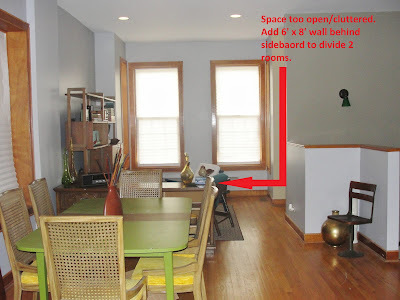 The wall will go behind the sideboard so the spaces are separate. A coffee table will be added as well as a TV in the empty bookcase space so we can play our old school Nintendo and watch laser discs. I like the kitchen, but I need more counter space. Wanted to add an island but it comes out too far into the walkway. Want to take the white bookcases on the left wall, fix them up, and add a small breakfast bar.